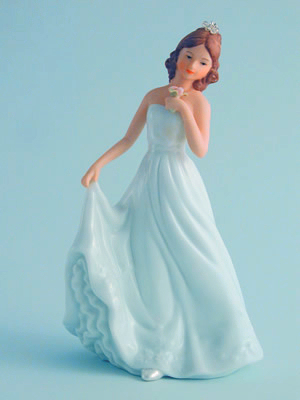 This delicate fine porcelain Quinceanera – Sweet Sixteen figurine features the young debutante gracefully curtseying, while carrying handmade baby pink rose. Also features a crystal flower hair piece. A perfect addition for your guestbook table, or to crown the top of your cake. Handpainted.